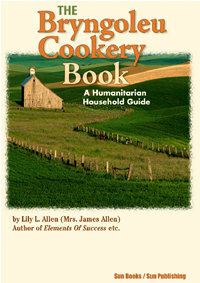 THE BRYNGOLEU COOKERY BOOK - A Humanitarian Household Guide by Lily L. Allen. Chapters include: Breakfast Menus for One Week, Home, Luncheon Menus, The Cuisine of the Compassionate, Dinner Menus, Hints to Housewives, Soups, Sauces, Gravies, Sweets, Bread and Cakes, Etc. 66 pages. 5x8. Paperback. ISBN: 0-89540-456-7. $8.00.